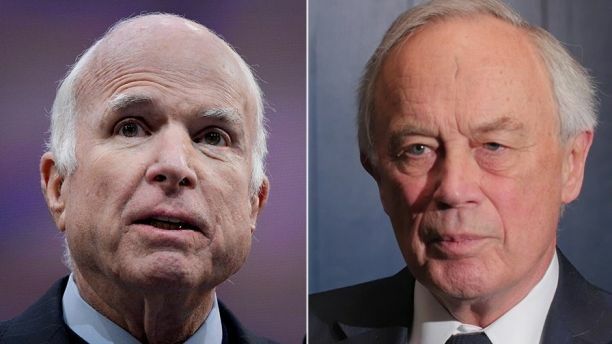 Sir Andrew Wood, right, says he acted as a “go-between” last year to inform Sen. John McCain, left, about the controversial “dossier” containing allegations about then-candidate Donald Trump. The man who says he acted as a “go-between” last year to inform Sen. John McCain about the controversial “dossier” containing salacious allegations about then-candidate Donald Trump is speaking out, revealing how the ex-British spy who researched the document helped coordinate its release to the FBI, the media and Capitol Hill. “My mission was essentially to be a go-between and a messenger, to tell the senator and assistants that such a dossier existed,” Sir Andrew Wood told Fox News in an exclusive interview with senior executive producer Pamela K. Browne.Fox News spoke to Wood at the 2017 Halifax International Security Forum in Nova Scotia, Canada. As Britain’s ambassador to Moscow from 1995-2000, Wood witnessed the end of Russian President Boris Yeltsin and the rise of Vladimir Putin. Just after the U.S. presidential election in November 2016, Arizona GOP Sen. McCain spoke at the same security conference. Wood says he was instructed — by former British spy Christopher Steele — to reach out to the senior Republican, whom Wood called “a good man,” about the unverified document. Wood insists that he’s never read the dossier that his good friend and longtime colleague prepared. It was commissioned by opposition research firm Fusion GPS and funded by the Democratic National Committee and the Hillary Clinton campaign. August 2016 is a critical period, just after the FBI opened the Russia meddling probe, and after then-director James Comey recommended against prosecution for Clinton’s mishandling of classified information. Wood said Steele had “already been in contact with the FBI” at the time. “He said there was corroborating evidence in the United States, from which I assumed he was working with an American company,” Wood said. British court records reviewed by Fox News as well as U.S. congressional testimony revealed that Steele was directed and paid at least $168,000 by Fusion GPS founder Glenn Simpson to push the research that fall to five American media outlets. According to British court documents, Steele met with The New York Times (twice), The Washington Post (twice), CNN, The New Yorker and Yahoo News (twice). “Each of these interviews was conducted in person and with a member of Fusion also present,” according to the records associated with separate civil litigation against Steele and Fusion GPS. Three weeks after Trump won the presidential election, at the Canadian security conference, the details were finalized for the dossier hand-off to McCain. British court records state McCain ordered Kramer to get a personal briefing from Steele in Surrey, just outside of London, and then return to Washington, D.C., where Fusion GPS would provide McCain with hard copies. In January, McCain officially gave the dossier to the FBI, which already had its own copy from Steele. Of note, listed in the official program for the 2016 November Canadian conference as a participant was Rinat Akhmetshin — the same Russian lobbyist who was at Trump Tower five months earlier in June for a highly scrutinized meeting with Donald Trump Jr. and others. It is not known whether Akhmetshin had any contact with McCain or Kramer. Fusion GPS and Kramer did not respond to requests for comment from Fox News. Asked for comment, McCain’s office referred back to a January statement that said he could not judge the dossier’s accuracy. Cyd Upson is a Senior Producer at FOX News. Surprise: MSM Ignoring Another Obama Scandal? Do Black Students Need White Peers? BREAKING: ISIS Bomber Terror Attack In New York! The Trump Economy Is Booming!! Senate GOP Passes Tax Cut Legislation! !